Caption slip reads: "Photographer:Tompkins. Date: 1959-09-02. Reporter: Tompkins. Assignment: Charles Eames exhibit explained at press conf. 70/71: Charles Eames and wife Ray pose in fashion Russian couples stood as they watched documentary film on screens in background. 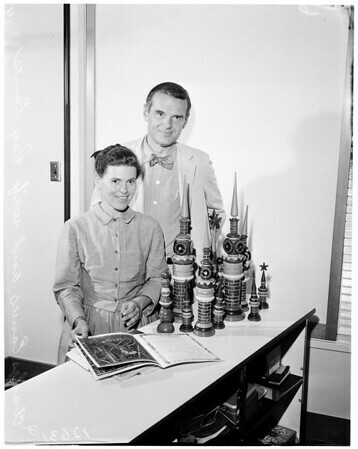 72/73: Charles and wife Ray Eames display Russian toys and books they brot [sic] back with them".